Does anybody else have a problem with the HD GUI not rendering properly (some pixels appear out of line)? I assume it is because my screen resolution is not standard (1366x768) as when the GUI scale is not set to large in full screen, then it doesn't appear. Does anybody know any way of resolving the issue other than setting the GUI scale or keeping default resolution GUI elements? I've assumed people haven't had issues from lack of comments, but I'd like to be sure it's not a big issue. The GUIs look fine to me, the only oddity is the creative gui. Portions of the tabs still use the original texture whilst everything else is hi res. Just a heads up, This is tagged as "defult" instead of "default". Please update to 1.7.2 when you can D: I love your texturepack! I was really trying to bring more depth to the textures with this project. I'll take another look at the grass, I did it quite long ago so I'm sure i can make it a bit better. As for my work process, I mostly just open up the default textures in paint.net, re-size them and draw on them adding more shadows and smoothing out the lines, usually not adding many colours. I should be updating this to 1.7 pretty soon (definitely within the week), I have most of the new stuff already done. Gonna download this and try it out. I'll give some feedback if I have any, but based on the screenshots, I love it. I was always partial to Defscape (minus mobs) over Faithful, but this is really nice and looks super vanilla. And just wanted to say that I don't use Faithful/Defscape anymore. This I can see myself using, but we'll see in-game I suppose :). This includes a couple of Mobs, some entities, a bunch of the remaining items and blocks (nearly all done!) and of course, most of the new stuff to 1.7! I'd love to hear your comments on the new stuff, and what you'd like me to change. The Stained Glass looks more like colored blocks, I can barely even tell it was textured at all :C.... Darker outlines on it possibly? if not :C eh I guess I can play with it. 4) you do not make revenue from my work in any form. I maintain the right to alter the terms of our agreement. Sure, I always give rightly credits and post links to the creators threads in my thread in the forum and in the TP itself in a txt file, the only new condition is MCPE exclusivity however the PE packs have new format and it's not compatible with other games... my only contribution is to combine some textures from the same pack to create the PE exclusive blocks n' items but in this case I think that I'm going to resize the default texture and try to give it the same look that you've given to the whole pack there are just 4 or 5 exclusive blocks so it's not really a big task and I don't use to remark it just mention it if someone asks. Ok, the pack is going to come out in a week maybe two, and thank you so much! 1. I hate unfinished texturepacks. Especially when their as good as this. 2. Sandstone looks like yellow bubbles. 3. 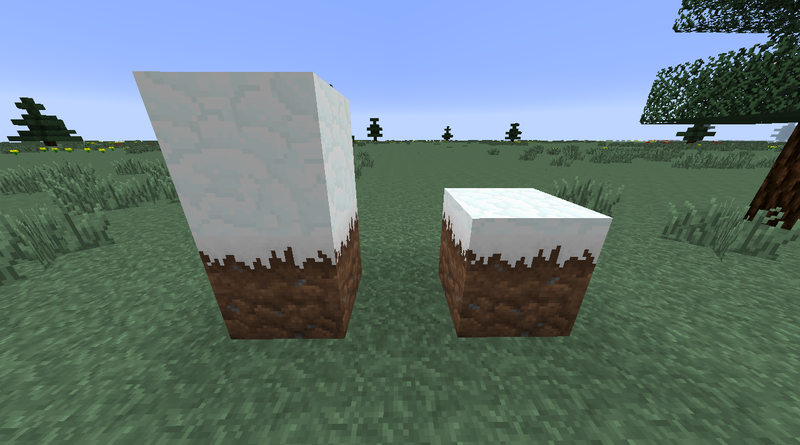 Bedrock looks like you tried to hard to make it HD. It turned out with me thinking it was dark concrete and crap mixed together. I'm sorry If you find these comments offencive. And I don't really expect you to take all of them aboard. All in all a good resource pack. This pack has a subtle elegance that I absolutely adore. I'm sorry If you find these comments offencive. And I don't really expect you to take all of them aboard. All in all a good resource pack. 1: Sorry, I hope I get back into it at some point, but it's pretty slow going at the moment. If you want a full experience, I'd suggest installing either Lithos or Faithul and then this on top of it (using the new resource pack stacking feature). That should fill in some of the blanks I have, but I honestly don't see too much of an issue because the default textures mix in well with mine (obviously). The flatter one is the original that I 'improved'. I like the extra depth, but if you like, I can put the old one in the next download as an alternate texture. 3: I am aware that bedrock is ugly, but I'm trying to be faithful tot he original... so that's what you get I might try to fix it sometime, but it isn't a very visible block, so it's not high on m list. Your comment has a poignant eloquence that I cherish. You might want to change your gravel, it looks like cobble.